A cohort of startups headed to San Fransisco’s Silicon Valley this month to represent the fantastic growth of innovation coming from the South West at Oracle OpenWorld – one of the biggest tech conferences in the world. And boy did they impress, with Bristol-based Zenotech making it to the finals at the conference’s Oracle Cloud Platform Innovation Awards in the ‘Move workloads to cloud’ category – with the trophy (pictured right) presented by last year’s winner (and fellow Bristol-based startup) Yellowdog. 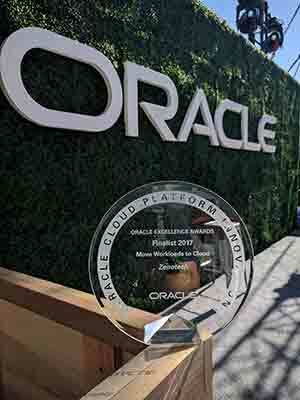 Zenotech was selected, ahead of over 70 nominations in the category, in recognition of the innovative use of Oracle’s Cloud Infrastructure. 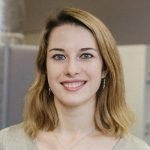 In Zenotech’s case, it uses Oracle Cloud to simulate complex engineering challenges through its EPIC software platform (Elastic Private Interactive Cloud) allowing customers to run and scale complex jobs in a high computing environment. Also present at the conference were some of the new members of Bristol-based Oracle Startup Cloud Accelerator – molecular simulator Nano Simbox inventors Interactive Scientific, machine learning and machine vision marketing technologists Duel, complex database developers for AI GRAKN.AI and searchable maps based on travel time innovators iGeolise – who showcased their cutting-edge technology. 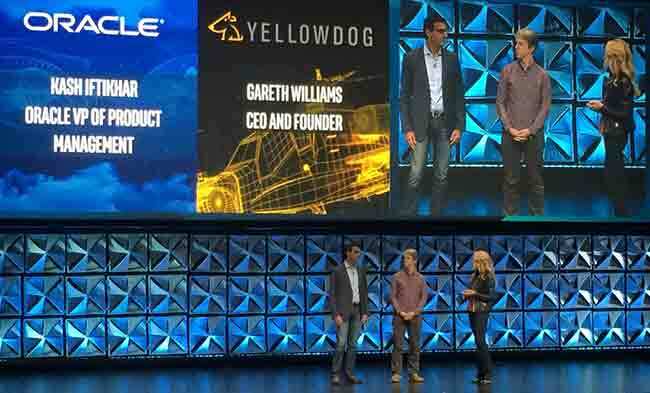 SETsquared startup YellowDog‘s founder Gareth Williams also joined Intel’s keynote on the emerging power of the cloud and shared his leading expertise as the world’s only provider of limitless computing (pictured, centre, in main image, above). Find out more about the Bristol startup accelerators involved in Oracle OpenWorld on the SETsquared website and the Oracle Cloud Startup Accelerator website. You can also get the low down on next year’s conference via the Oracle OpenWorld website.